The award for product of the week at Ellevisage Beauty and Ellevisage Training Academy goes to……. 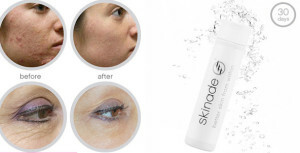 Skinade was introduced in to our salon only two months ago. Since introducing the product, our clients have been hooked. The product is not pyramid selling or going to promise you’ll have a face and body like Cara Delevinge in 24hours. It’s a health product that contains high quality ingredients to rebuild and strengthen the collagen of your skin working from the inside out. For all the ladies and men reading this blog who are less than 25 years old and are thinking ‘nope, this is totally a product for mum or dad, I SO don’t have any wrinkles and totes will have flawless skin forever’. Sorry to dampen your cloud, but you are wrong!! The product can be taken by anyone over the age of 18 years old. Skinade is a drink. It works from the inside out to rebuild and strengthen the collagen matrix below the skin’s surface, boost natural levels of hydration and reduce fine lines and wrinkles. Its high-grade collagen is sourced from fresh-water fish, which is low in sodium and avoids mercury contamination. It is a precious ingredient and we include 7000mg in each bottle. · Healthier, stronger and faster-growing hair and nails. · An improvement in the appearance of cellulite. Why not take a pill? If you were to try to take skinade’s ingredients in tablet form, you’d need to swallow around twenty large tablets daily. Not only is this difficult, but the body also finds them tough to digest. The valuable nutrients would pass through your system unused instead of being absorbed by the body. The collagen and essential ingredients in skinade are in liquid formulation and 80% to 90% are absorbed by the body, while tablets offer an absorption rate of only 30% to 40%. Skinade has been precisely formulated with the optimum ratio of liquid to active ingredients including key nutrients, MSM, L-lysine and vitamin C, which are essential for the healthy production of collagen. Skinade’s highly bio-available liquid formula, ensures that the body is able to quickly absorb and make use of them. Skinade is suitable for both male and female adults (over 18 years) who want to do the very best for their skin. For skinade to be effective, it needs to become part of your daily skincare regime. For best results, we recommend that you drink one bottle each morning before or with breakfast. We would advise avoiding caffeine 1 hr either side of taking skinade as caffeine can hinder the absorption of the essential micro-nutrients and collagen. If you’re feeling tired during the course of the day, the B vitamins in skinade will give you an energy boost. Skinade does not have to be stored in the fridge, but it tastes better chilled. · Marine collagen: Our high-grade marine collagen is sourced from fresh-water fish, low in sodium and avoiding mercury contamination. We’ve included 7000mg in each bottle. · Vitamin C: Essential for natural collagen formation and maintaining the collagen matrix. It also provides vital protection for the skin by boosting the immune system and reducing free-radical damage. · MSM: Is a naturally occurring form of organic sulphur found in all living organisms. It helps collagen and keratin formation, improves skin elasticity and inhibits cross-linking of collagen cells, a major cause of skin ageing. · B Vitamins: Our vitamin-B complex promotes more uniform, clearer, glowing and radiant skin. · Omegas 3 & 6: We source our omegas exclusively from organic flax seed oil that plays an important role in balancing dry and oily skin. · L-lysine: An essential amino acid that is key to rebuilding the collagen matrix at cellular level. Go on, give us a call to place your order today! !